After our recent visit to London City, SLE has returned again, this time Tea Couturier sat down with Billy Arrentire, Co-Owner & Operator of London City. London is one of the fashion meccas in the world. However, it offers so much more than fashion. There are many popular tourist sites to see. 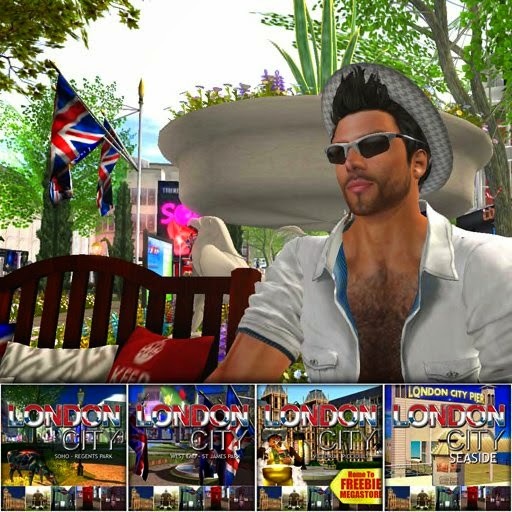 If you have never visited London, England, then you will be happy to know that in SL they have created a replica of London which not only looks similar but also has that London feel. Venues in SL can be very hard and expensive to run, as well as update. Of course the time and effort spent to build up a location in SL, is necessary in order to provide visitors with a fun experience. Fun experiences can lead to repeat visitors. I was curious as to how such a busy and popular sim as London City, stays busy. I also wanted to know what keeps the owners motivated in SL. I decided to contact one of the owners Billy Arentire and ask him how London City in SL has stood the test of time and still one of SL top destination venues. Tea: Can you tell us a bit about yourself and how you started working as the Architect Manager for London City inSL? Billy Arentire: I came to Second Life to build and spent the first several months of my SL in sandboxes working on my skills. From there I went to build for an Estate with a similar theme, along with my partner Torric Rodas. In a short space of time it was clear we were both doing all the work and getting none of the reward so decided to open London City. Tea: What can our readers find when they tp to London City in SL? Billy Arentire: London City is comprised of four regions, each representative of a different area of London. There are two parks, Regents Park where visitors can visit the Cenotaph or hang out and chat with people from all over the world, Victoria Park features the historic Burdett-Coutts Memorial Drinking Fountain and open air Concert Area. There are also two large Freebie Shops that cater to New Residents in SL as well as more than 150 of Second Life's top designers featuring clothes, gadgets and more. Take a romantic stroll along Victoria Embankment, drive a speed boat for float lazily along the Thames. And for those on a Sight-seeing excursion, Big Ben, Trafalgar Square and the London Underground are just the tip of the iceberg. If you are feeling more adventurous, London City Seaside is the place to be. With a taste of Margate and Brighton, the Seaside offers donkey rides, boat rides and bike rentals. Soak up the Great British sun on the beach or paddle in the ocean. When the sun goes down the London Night Life begins. With a total of 9 clubs and pubs there is something for everyone. Each venue is open nightly with themed events, contests, trivia matches, live DJ's and the friendliest Hosts you'll find in Second Life. Tea: You also run a club there, which I have been to many of the events. Your hosts are so much fun! Is it hard in SL to keep the people coming back, again and again? Billy Arentire: We are blessed with a wonderful group of Venue Managers who work very hard to keep the 9 clubs and pubs in London City fresh and exciting. Tea: What are some of the other events that you have in London City? Billy Arentire: Aside from the 9 venues trading every day of the week, we also host weekly concerts and special events each Saturday. The concerts are held in Victoria Park, London City3 and often tie into a real life event. This week’s concert is a reflection of both Glastonbury and Pride. Tea: Would you say that SL has changed since you joined SL? Have the changes affected the way you conduct business in London City? Billy Arentire: No I think it is just like any RL business you have to change with the times and keep in touch with the trends to keep the business running. Tea: What do you like to do when not busy working in SL? Billy Arentire: Building and creating fun and interesting places in London City hardly seems like work. When I'm not busy in the Estate I'm involved in other Community based events across the grid. We were pleased to be asked as the only London to exhibit in this year’s SL11B, a project that was both fun and inspirational. Tea: Wow! Very exciting…What is next for London City for the rest of the summer and beyond? Billy Arentire: There is so much planned for the rest of the 2014, our Summer Festivals will continue right up to autumn. We try to follow events in real life as closely as possible, so as events are announced we prepare for them here in London City. It's a great way for those who do not live in England to get a real flavor for it. We are always changing with the growing needs of the community, creating new and fun things for visitors to see and do. Running any business whether in RL or SL is hard work but when you have a good business concept, a good team and loyal supporters, London City in SL has proven you can still run successfully through the good and bad times.